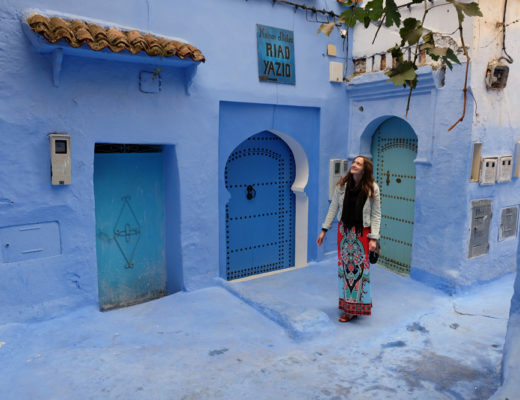 What’s the first thing you think about when you think of Morocco? 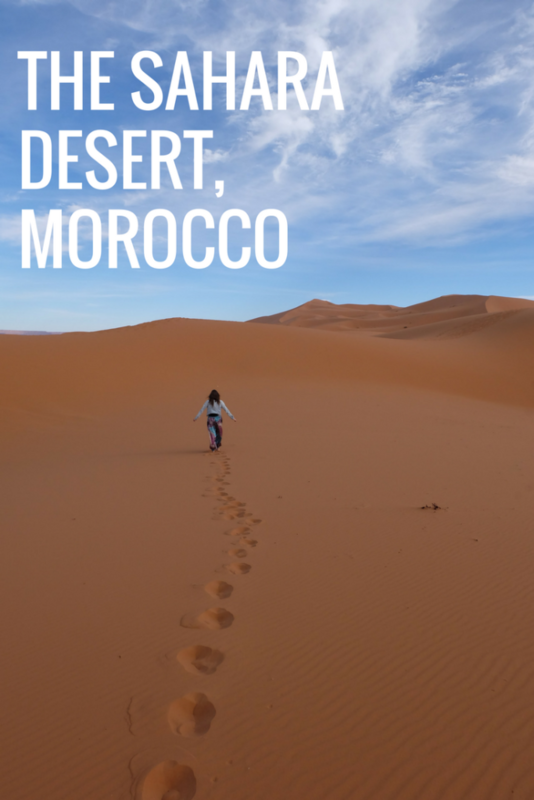 For me it was the desert, miles of golden sand, camels walking below the hot Moroccan sun. 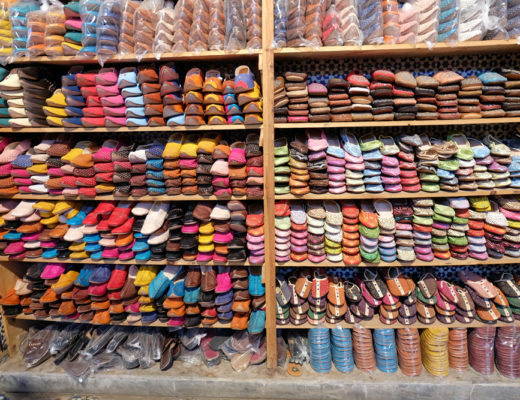 This to me was part of what intrigued me to this beautiful North African country. 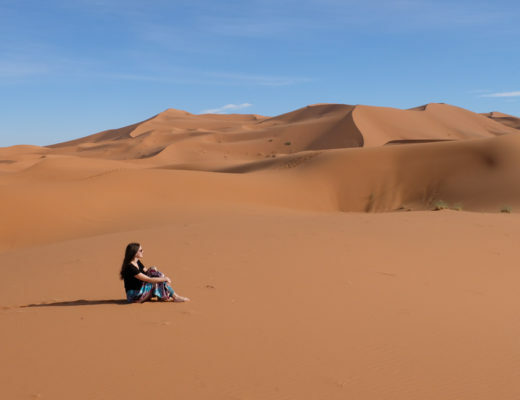 The Sahara Desert covers the majority of Northern Africa and is the third largest in the world and it was on my bucket list to visit it! 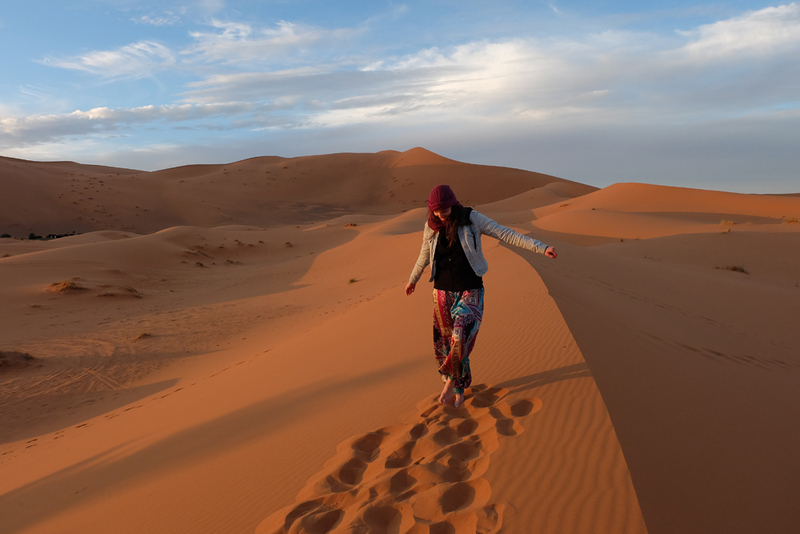 Although I spent two weeks in Morocco and saw a lot of amazing things, I don’t think anything can beat feeling the sand between your toes at the friggin’ SAHARA DESERT! 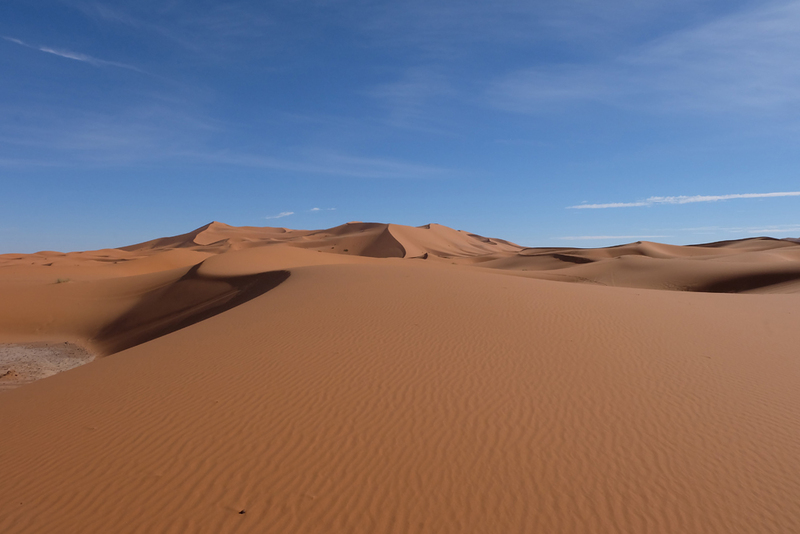 When we arrived at Merzouga, a small town near the Algerian border, it was pitch black outside. The drive took almost all day to get there from Fes, and when we arrived we couldn’t really see what was waiting for us beyond the darkness. We checked into our auberge (aka hotel), and when the sun came up in the morning, I was eager to go check out the landscape. 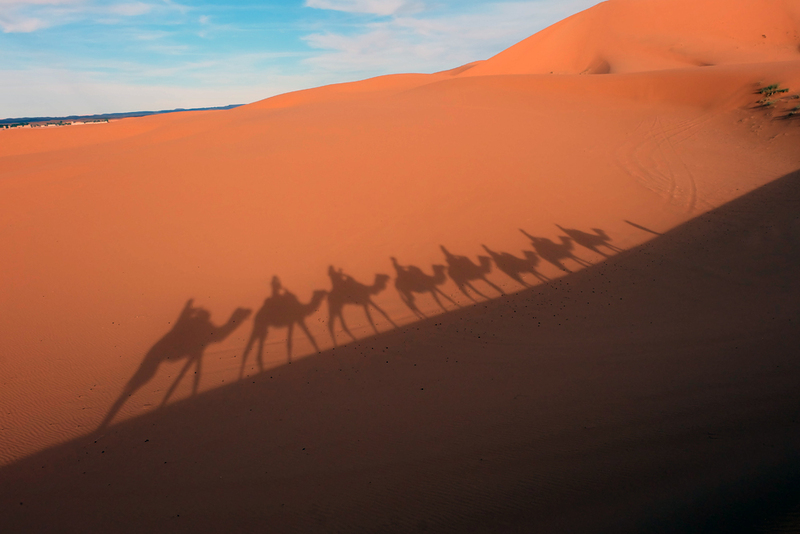 And I was even more excited to head out on our camels to our desert camp for the night. 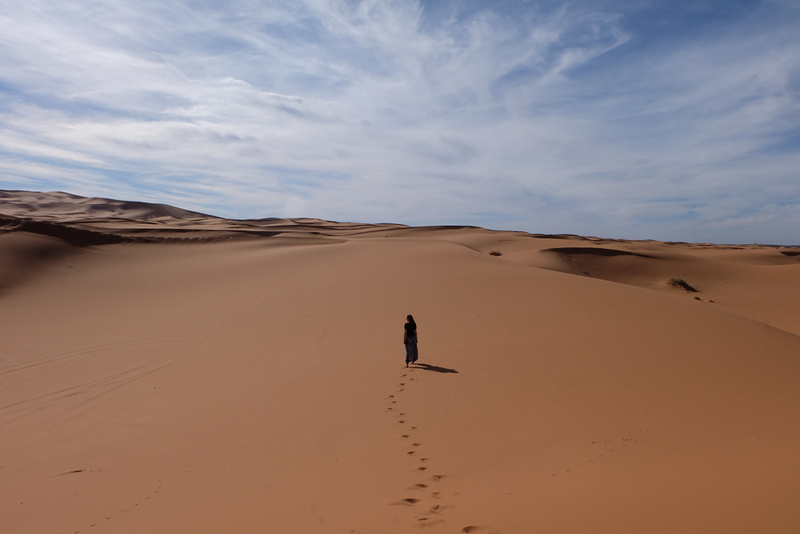 However, before our night in the desert, we embarked on a 4X4 tour around some of the areas of it first. 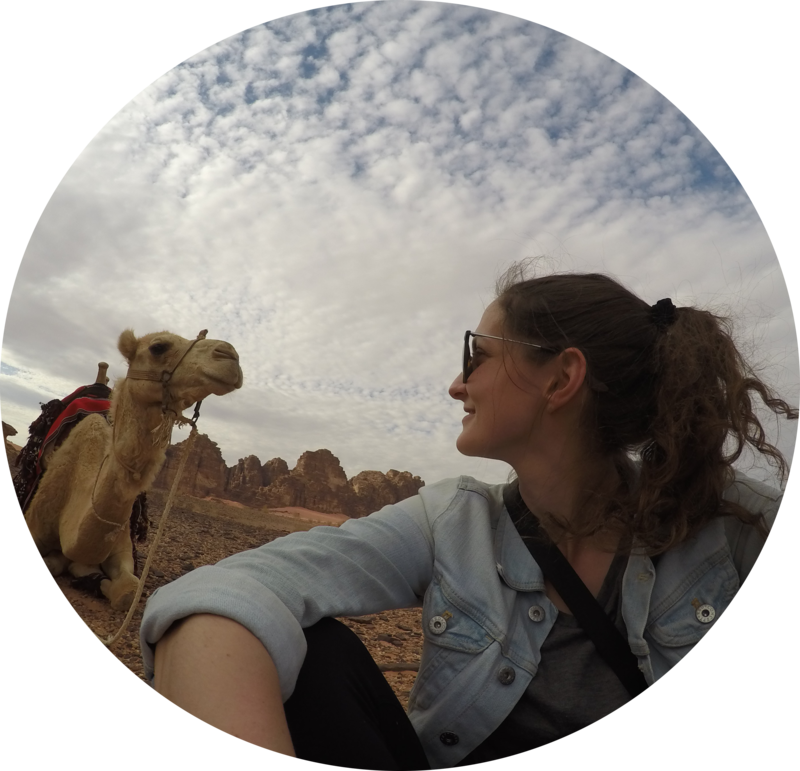 It was really cool to see the different landscapes in the desert, and also learn and experience how some of the locals and nomads live there. 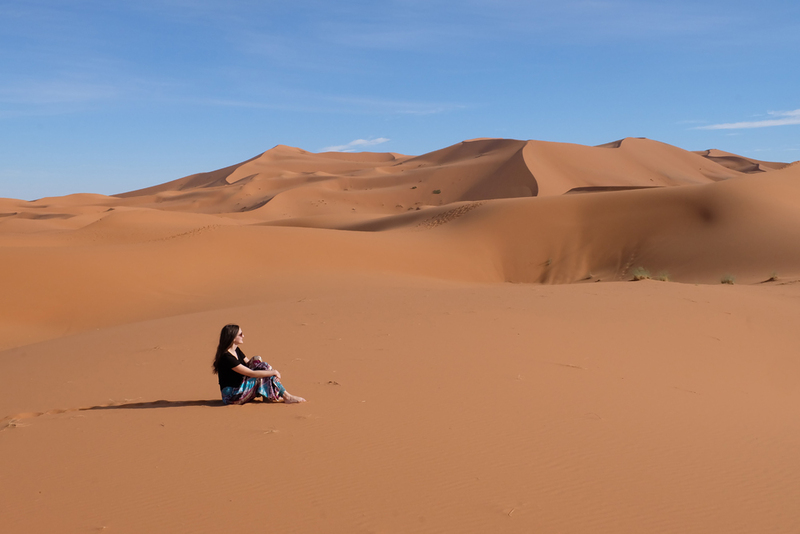 Nomads roam freely throughout the desert, not often staying in one place for long and living off the land. The women play an important role in raising the family, and often the men have multiple wives with many children. 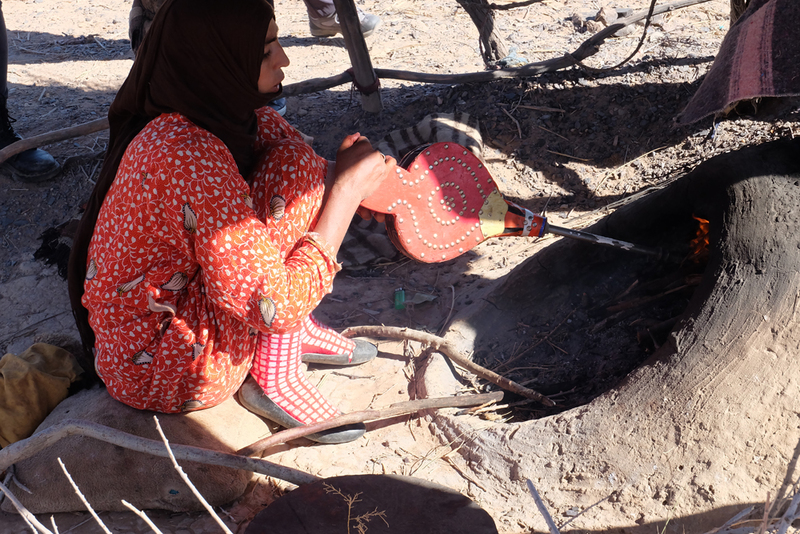 The family we visited included three wives and around ten kids all living amongst a small tent that was made out of recycled materials like old clothes (see below). 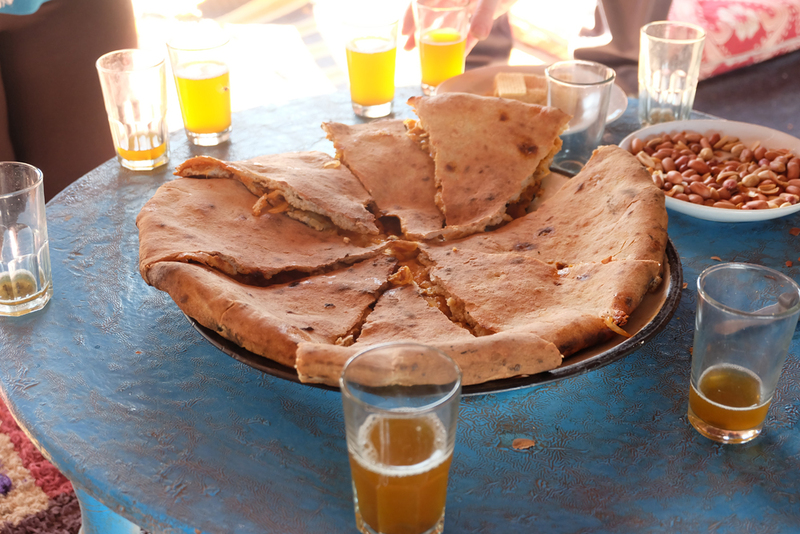 When we visited the family, they made us what they called “pizza” which was made in a small, handmade, stove for us, and of course, we had some mint tea, because you can’t go far without finding mint tea in Morocco. It was a really unique experience to get to see how these people lived. 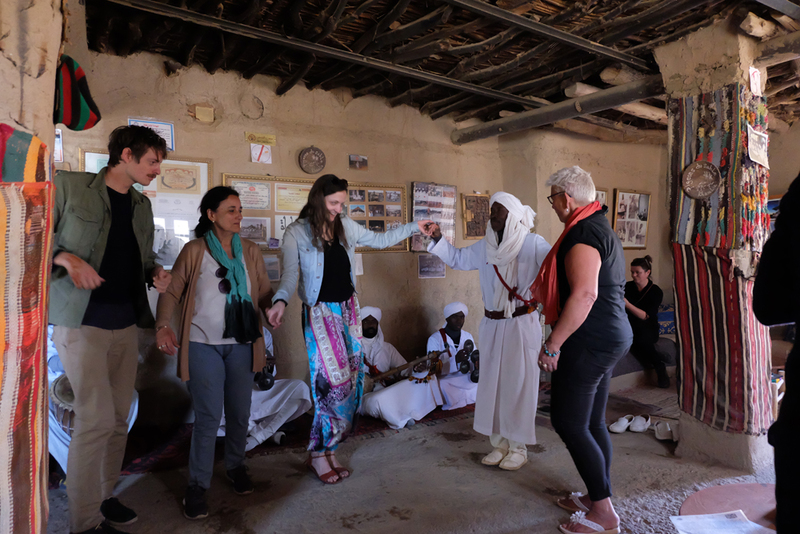 On our 4X4 tour we also had the chance to listen to some local music by Les Pigeons du Sable. 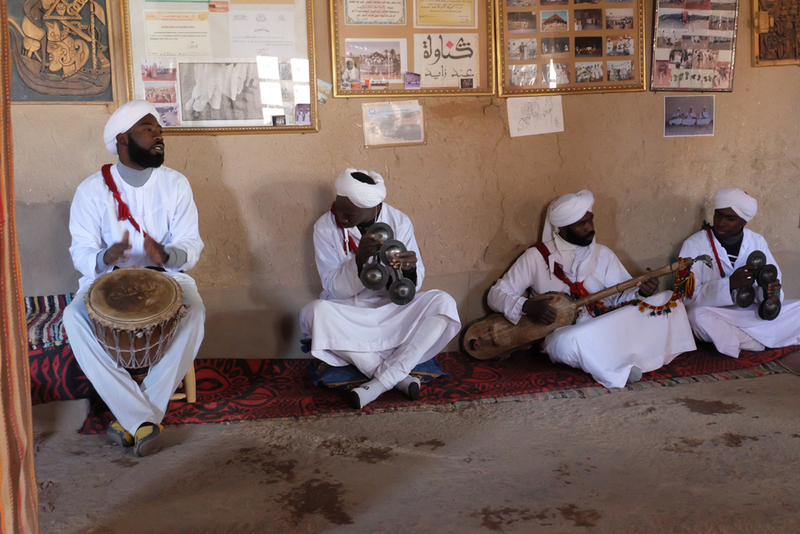 This local musical group started in 1995 and has had a very positive impact on the local economy as many tourists make a stop here for a cup of tea and to enjoy the Gnaoua music. The group today consists of 21 members and teaches music and dance to local children. 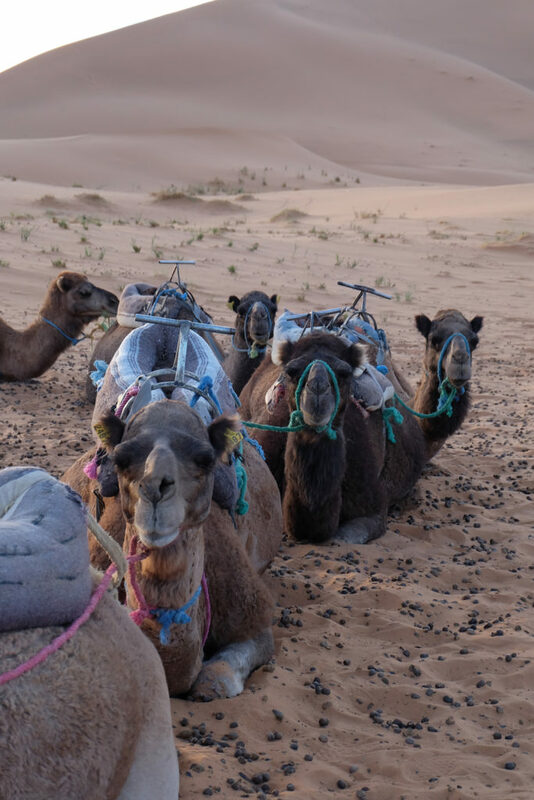 From there, we headed back to our auberge where we got ready to climb onto our camels and head out to our desert camp which was about a 1-1.5 hour ride away. 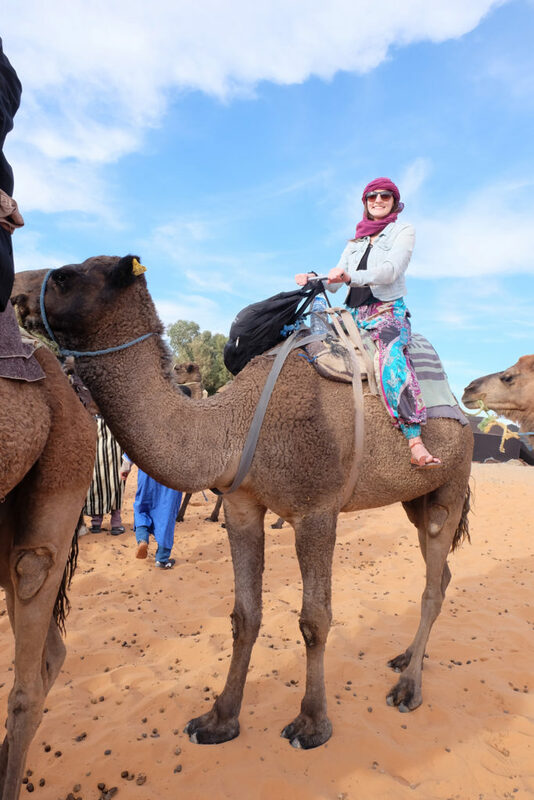 Riding a camel through the Sahara was hilarious, uncomfortable, and one of those bucket list experiences that you just never want to forget. 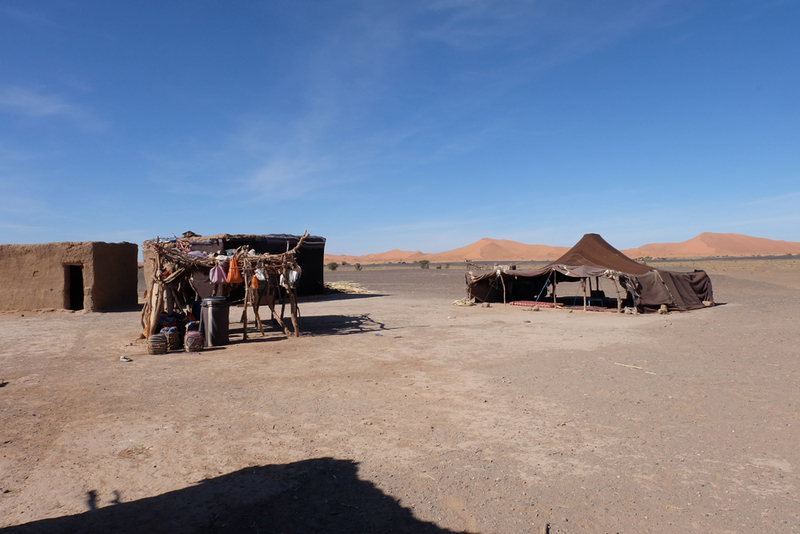 As we approached our desert camp for the night, I was pleasantly surprised at how comfortable it was. We had toilets and mattresses! Which I mean, what more could you need? 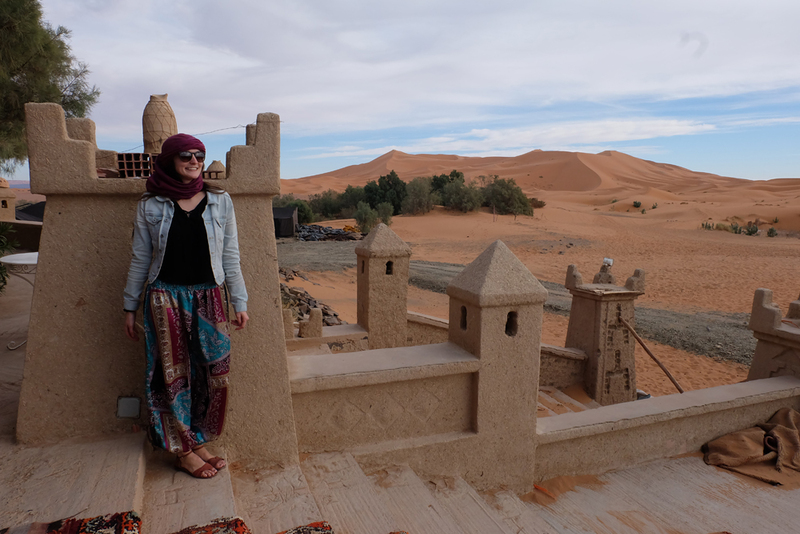 Once we arrived, we quickly put on multiple layers because shockingly enough, the desert gets pretty chilly at night during certain seasons (I was there in December). I layered on basically every piece of clothing I had, but I wish I had brought a light winter jacket with me. 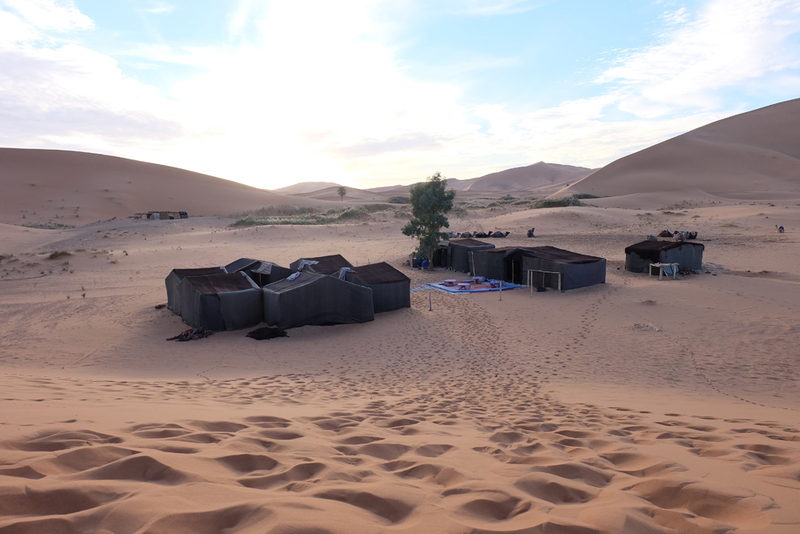 Once we were layered, we climbed up a dune to watch the sun set over our camp before we headed down to sit around a fire, drink mint tea, eat olives and get ready for our desert dinner. After dinner we hung out, drinking local wine that we brought with us and when we got too cold to be outside our tents anymore, we curled into our tents with a ton of blankets and all our layers to try and keep warm. I have to admit, I don’t think I’ve ever been that cold sleeping before but it was only one uncomfortable nights sleep! In the morning we woke up before the sunrise to get back on our camels, although when the air is cold, it’s 5am and our butts hurt from our camel ride the day before, getting on the camel to go back wasn’t as exciting. 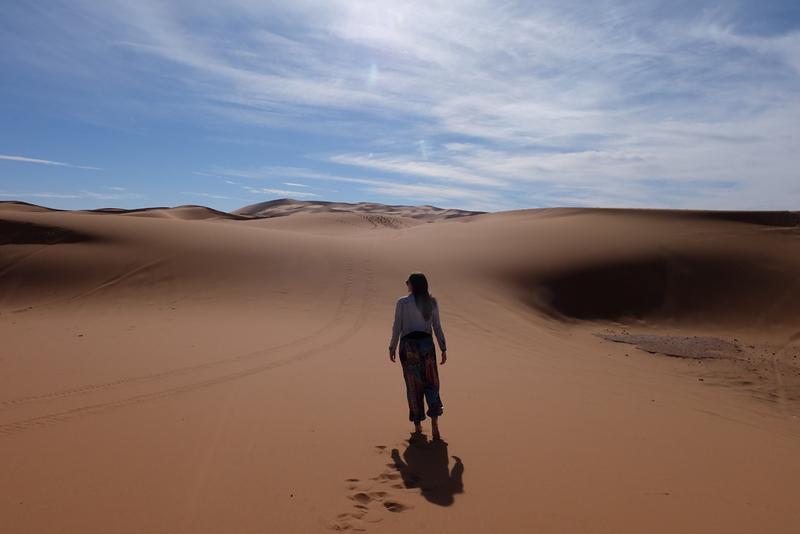 As we walked back towards our auberge, we watched the sunrise over the dunes before we got ready to leave the Sahara behind us and move onto our next spot.